Sheffield – along with other Northern Powerhouse cities such as Manchester, Leeds and Liverpool – could be the engine of a Fourth Industrial Revolution using Blade Runner style digital technologies to transform the productivity of UK manufacturing. That’s the view of Rab Scott, Head of Digital at the Advanced Manufacturing Research Centre following the publication of the Industrial Digitalisation Review, Made Smarter. A few weeks ago Juergen Maier came to the Sheffield to open the Mindsphere Lounge: not some futuristic backdrop to a scene starring Ryan Gosling and Harrison Ford, but a cutting edge, cloud based operating system that allows manufacturers to harness big data from billions of intelligent devices, to unlock transformational insights across their businesses. Maier, who chaired the independent Industrial Digitalisation Review, Made Smarter, is no stranger to Sheffield and Rotherham. 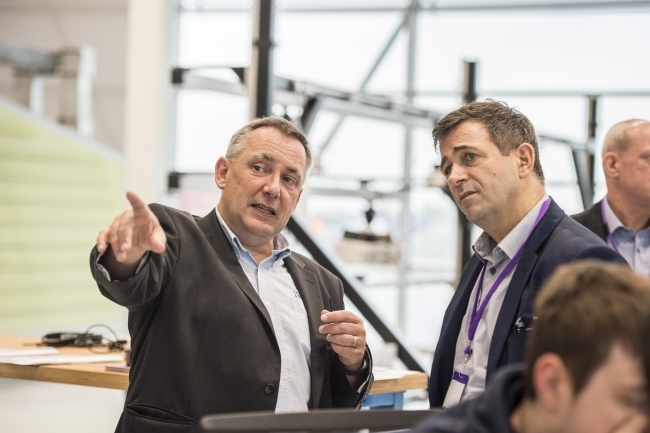 As the Chief Executive of Siemens UK, he is a familiar face at the University of Sheffield, and especially among the aspiring young engineers in the Diamond Building where the new Mindsphere Lounge is located. During the opening of the new facility, Maier told his audience that Sheffield – think Bessemer, Stainless Steel and Siemens own Open Hearth process – had been home to the first and second Industrial Revolutions, and now it had the opportunity to lead the fourth. By that he meant a digital revolution: a revolution founded on technologies such as virtual reality and augmented reality; on robots and cobots; on artificial intelligence, machine learning and blockchain; on harnessing data and using it to better organise and manage assets and processes; and on the Internet of Things. 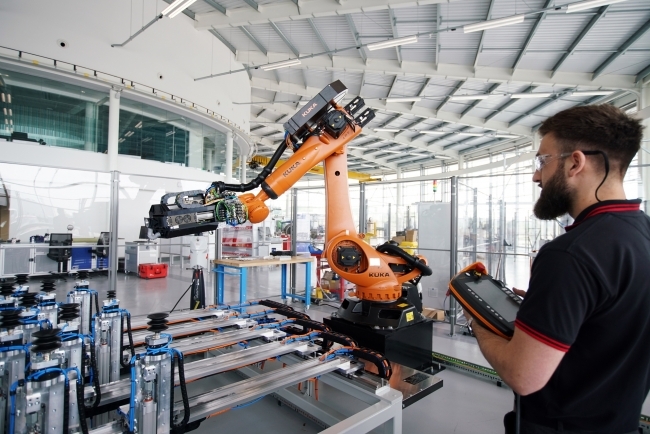 What he meant was that the AMRC – and other members of the High Value Manufacturing Catapult – are blazing the trail for digital manufacturing: de-risking what can sometimes seem far-fetched technologies such as the creation of digital twins, or machines that can learn. As someone who has helped on his report, I know he cares deeply and passionately about the fate of UK manufacturing. It is a sentiment shared by everyone at the AMRC, an organisation established more than a decade ago by a handful of visionary academics and industrialists, with a mission to transform the productivity of manufacturing in the UK by harnessing the power of research to the needs of industry. His report is a clarion call to politicians, industrialists and academics: get this right and we can rebalance our economy; bridge the divide between the north and the south; create new sources of wealth that are more fairly shared among those who have helped make it; and inspire a new generation of engineers with the prospect of highly skilled, high value jobs. But this prize is not in Juergen’s gift. Nor is it in the gift of government – although all eyes will be on the Chancellor to see how deep he digs into his pocket when he responds to the review’s requests for funding in his Autumn Statement in November. As an entrepreneur and a manufacturer, Juergen knows that the success of the Fourth Industrial Revolution will require inspired leadership. It will also require a willingness to adopt technologies that can seem more like science fiction than science fact; and a passion for transforming innovative ideas into technologies to drive big gains productivity. These are big challenges. The measures he proposes, from a Made Smarter UK Commission and the creation of a more visible and connected digital ecosystem, through to building on the existing innovation landscape to create a network of digital hubs, centres and demonstrators, go some way to meeting these challenges. There is much we can do – and are doing – ourselves. But our success in delivering often undreamt of productivity gains for our partners, and in de-risking new digital technologies and processes to accelerate their implementation on the factory floor, comes with a price tag. We need new buildings, new talent, and new spaces to meet the growing demand for support in adopting the digital technologies that will be the engine of the Fourth Industrial Revolution. This has always been a dilemma for us. Ever since Prince Andrew opened our first building in 2004, the demand for our skills has put pressure on us to expand. What started out as tightly knit group of nine or ten people is now a global institution with partners from around the world who work with us on game-changing projects here in Sheffield and Rotherham. We also have satellite centres in Asia, the Middle East and North America. Perhaps this is where political leadership comes in. If Juergen’s prognosis is correct – he says that failure to adopt these technologies will lead to long term industrial decline – then his review requires a coherent response from policy makers at national and regional level. The AMRC, and the other members of the High Value Manufacturing Catapult, are committed to providing the leadership, innovation and support for early adoption that are crucial to making the Fourth Industrial Revolution a success. The AMRC is doing this across the North, from a soon-to-open AMRC in the North West and North Wales (the latter supported wholeheartedly by the Welsh Government); and an emerging institution near Glasgow which draws inspiration from the AMRC in Sheffield, and support from the Scottish government. 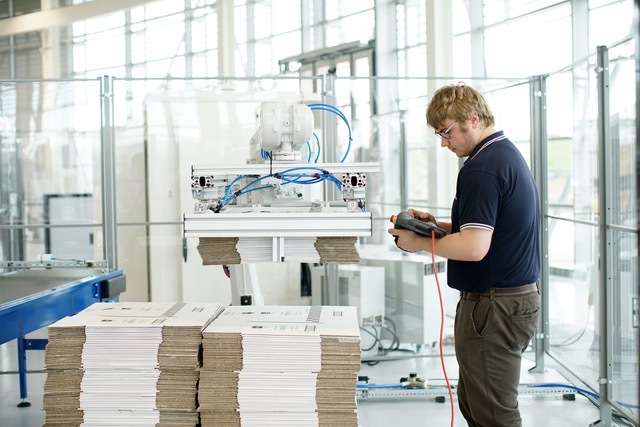 We share Juergen’s positive vision for advanced manufacturing. And we are working with him to make good his dream that the North – with Sheffield and Rotherham centre stage ­– becomes the engine room of innovation that will drive the Fourth Industrial Revolution. Like the first and second revolutions, we believe this will transform all our lives for the better.